Politicians must forge a plan to legalize assisted dying in Britain, campaigners and experts said on Monday. Meanwhile, public concern is growing in the UK as more and more terminally ill people are opting to end their lives, both in Britain and abroad. In a letter sent to the Daily Telegraph, some 80 politicians, doctors, clerics and writers said an “overwhelming majority” of the British public now backs legalization for assisted suicide. The alliance stressed the time had come for Parliament to take action and resolve the longstanding issue. The letter’s signatories, including the former Archbishop of Canterbury Lord Carey and renowned author Ian McEwan, said Britain is edging “closer than ever” to a landmark legislative shift on assisted suicide. Lord Falconer’s proposed Bill continues to progress through the House of Lords. As a result, the government’s refusal to host an open debate on the issue would be a“heartless”decision, the alliance argued. The signatories warned that a UK citizen travels to the Dignitas clinic in Switzerland every month for assisted dying, and almost 115 terminally ill people on average take their own lives in Britain each year. A study released earlier this year, however, indicates the figure of terminally ill people who choose to commit suicide annually in Britain may be higher. The research, based on figures released under the Freedom of Information (FoI) Act, concluded that people with terminal illnesses may account for 300 suicides a year. It also suggested that the high rate of suicide among the terminally ill in Britain is a result of the state’s strict assisted suicide laws. Advocates of assisted suicide warn that a definitive legislative shift is urgently required to clarify Britain’s existing laws, and to relieve unnecessary suffering in the closing months and weeks of many people’s lives. But critics argue it would mark a passage into previously uncharted territory, allowing the state’s doctors to take an active part in people’s deaths for the first time in British history. Despite mounting calls for a clear change in Britain’s law, PM David Cameron said he would challenge plans to legalize assisted suicide. Cameron has indicated, however, that MPs will vote on the issue should they debate it in Parliament. The proposed assisted dying bill, tabled by Lord Falconer earlier this year, would let doctors prescribe a lethal dose of narcotics to terminally ill patients with six months or less to live. However, such patients would need to demonstrate a clear and unwavering intention to terminate their own lives. As the bill underwent scrutiny in the House of Lords, peers recently voted to amend it by ensuring that assisted suicide would be accompanied by judicial oversight. The open letter’s signatories say the bill, in its amended form, creates the potential of a “safeguarded choice” to die. But the proposed legislation has been staunchly opposed, particularly from disability rights activists who say it could put vulnerable citizens under undue pressure to take their own lives. In the run-up to May’s general election, the bill won’t become enshrined into law, even if passed by the House of Lords. As a result, the letter’s signatories sought pledges from the nation's major political parties to ensure the legislation is revived in the new parliament and debated. A Zurich University study published in August revealed that 20 percent of those who travel to Switzerland to terminate their lives are from the UK. 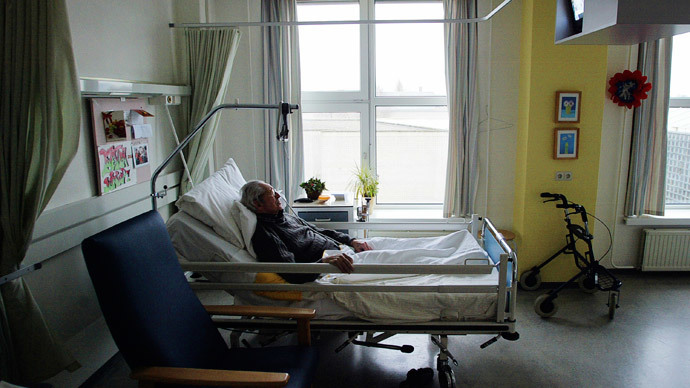 The study also indicated that the number of British people opting for assisted suicide in Switzerland increased dramatically between 2008 and 2012.